How Did Falun Gong Commemorate April 25 Worldwide? On April 25, practitioners of Falun Gong around the globe held commemorative events to remember a historic incident that unfolded sixteen years ago. Two days before that fateful day in 1999, about forty Falun Gong practitioners in the Eastern Chinese city of Tianjin were beaten and arrested by local security forces. This shocked practitioners of the traditional Chinese meditation—this was the first time that the Chinese regime had used such heavy-handed tactics to deal with Falun Gong since it was introduced to the public in 1992. Practitioners appealed to the Tianjin police for the release of their fellows, but the police told them to look for the Party higher-ups in Beijing instead. So Falun Gong practitioners across mainland China—about 10,000 in total—journeyed to the Central Appeals Office to make their case on April 25, 1999. Police, perhaps with prior planning, directed them to the streets around Zhongnanhai, the headquarters of the Chinese Communist Party. Eventually, Zhu Rongji, the former Chinese premier, spoke with some practitioner representatives, and promised that those detained in Tianjin would be released and that the Party didn’t oppose Falun Gong. The Falun Gong practitioners then quietly left, clearing the pavements they occupied of litter and policemen’s cigarettes butts on the way home. But the promise was short lived—former Chinese leader Jiang Zemin ordered a crackdown on July 20 that year—but the moment where Chinese people peacefully and successfully bargained with the most brutal regime in history is still remembered today. Benjamin Ismail, Head Asia-Pacific desk Reporters Without Borders (RSF), a France-based non-profit media watchdog, spoke at the commemoration event. Ismail believes that people can help to end the persecution of Falun Gong sharing the truth of the matter. 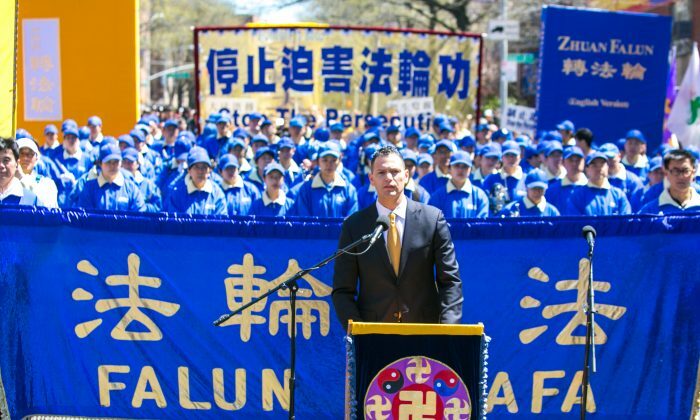 In China, it is crucial that people are able to break down the Great Firewall of China and gain access to uncensored information about Falun Gong and the persecution, which is an issue that everyone should be concerned about. On the evening of April 24, a candlelight vigil was held in downtown Brisbane. One passersby, Reese Martin, signed a petition after learning what the April 25 event was about and the on-going live organ harvesting in China. The 10,000 Falun Gong practitioners who stood up for their faith on April 25, 1999, set a precedent for the rest of China. A mistake in an email’s address field led to a scandal showing China’s influence over New Zealand policy.